At J&J Fence, we believe in offering high quality fence services at affordable prices. That is why we are known as Santa Monica's best value in fencing, gates and more. We have been serving the perimeter, decorative and security fencing needs of homes and business for over 30 years. Not only are we very experienced--having constructed thousands of fences across LA County--but we are also specialists in our trade. Each person on our team has worked with iron, wood, vinyl, and other common materials for fences, gates, window bars, railings, and more for at least 15 years on average. Everything we construct is custom-made. So, if your fencing project isn't listed above, we can likely construct it for you. No matter where you are in your design process, we are happy to talk with you to explore the possibilities and pricing. We can come to your site and even assist with your planning process. Once we are hired to do a job, you can trust that your project will be done in a timely manner and constantly supervised by ownership. J&J Fences is family-owned and -operated and committed to offering excellent service. We are licensed, bonded and insured, and never use subcontractors. Call today to learn more. New customers receive 10% off! J&J Fence specializes in hand forging and installing wrought iron, security iron and decorative iron for fences, window bars and railings in homes and businesses across Santa Monica. Don't let another contractor tell you that these types of iron are all the same. Our security iron is of the strongest grade, allowing for tall and protective, yet elegant protective fencing. Ornamental iron allows us the greatest flexibility for decorative designs, and can include scrolls, leaves, medallions, stars, flowers and other touches. For those who want iron of the highest quality for their fence, staircase railing, balcony or window grill, we offer traditional wrought iron that is sure to elevate the look and value of your home or business. 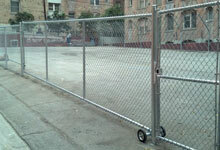 We have installed chain link fencing for homes, dog kennels, tennis courts and high security properties. Depending upon the need, this fencing can include a ceiling, locking mechanisms, security access controls, barbed wire, razor wire, privacy slats, and more. Our customers throughout Santa Monica prefer chain link when they need a versatile, low maintenance, and long-lasting fence. We help residential and commercial customers from Santa Monica achieve the wood or vinyl fences they have always wanted. Using premium grade cedar, redwood or vinyl, we can build custom fencing to create a secure perimeter or a welcoming, short decorative fence to complement your landscape. We can construct a fence strictly following your specifications or help you design and plan your project. If you are unsure whether to go with wood or vinyl, we can provide a free consultation regarding the pros and cons of each. Call today to speak with one of our wood and vinyl fence experts. At J&J Fence, we pride ourselves on our ability to create beautiful, high quality custom fences and gates. Since we can construct and work with cinder block, iron, steel, wood, vinyl, chain link and more, the possibilities for building a unique fence and gate are endless. Our talent in manipulating these materials allows us to combine materials (such as iron and cinder block, iron and wood, etc.) as well as create steel staircases, window bars, railings and handrails. Additionally, we can build a gate to match any of our fences. 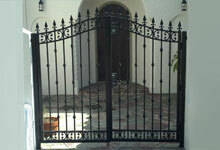 Our gates feature high quality hardware (latches, locks, hinges, etc.) and can be modified with security access control systems or electric operators. We also carry and install roll up doors and folding gates. Call licensed, bonded and insured J&J Fence today. 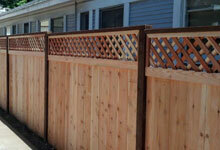 We are your local fence contractor, serving the needs of our neighbors across Santa Monica for over 30 years. 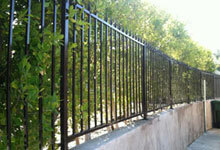 This is a residential fence installation in Santa Monica, CA. 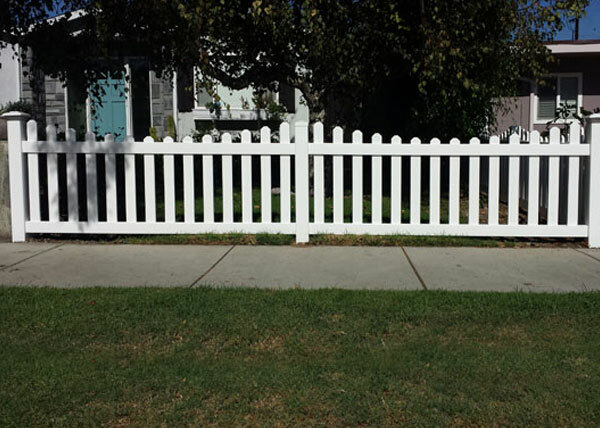 The white vinyl picket fence features a scalloped top style, dog eared pickets, and New England style posts. Vinyl fences are known to be long lasting and low maintenance. All vinyl fences and gates receive a lifetime warranty.